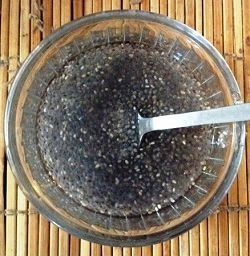 Mix chia seeds and water and set aside to gel for 10 minutes. If you prefer your scones dense and moist, use 6 T; if drier, use 5 T.
Using a knife, cut the circle into 8 scones and using a pie-spatula or small pancake turner, gently separate the pieces from each other. 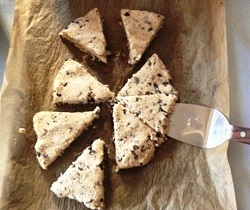 Adapted from this Lemon Chia Seed Scone recipe.